Our groups – disability, transit and advocates for pregnant women – assert that this tragedy should not be in vain. Currently, fewer than 25% of the city’s subway stations are accessible. 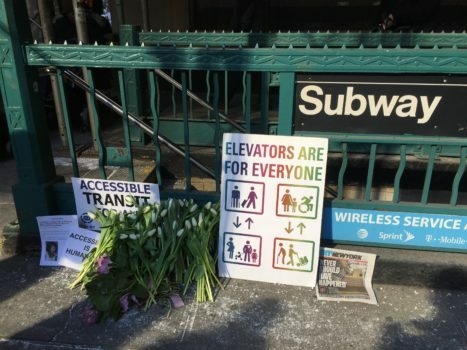 In 2017, many of our groups sued the MTA, which Governor Cuomo controls, in state court charging the lack of subway elevators is a violation of the city’s Human Rights Law. The Governor and the MTA have not settled the lawsuit. Today, join us in urging Governor Cuomo to settle our lawsuit with a commitment for a plan of full subway accessibility. Call Gov. Cuomo at 212-681-4580 and tell him: Make the subways safe and accessible for all New Yorkers! « Urge Governor Cuomo to include a funding increase of only $5 million for Independent Living Centers in his budget proposal!